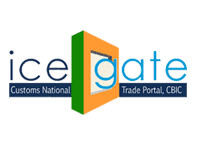 ICEGATE stands for Indian Custom EDI Gateway which is an online e-commerce portal of the Indian Customs which offers services like bills of entry (Import Goods declaration), shipping bills ( Export Goods declaration) and EDI between customs and its trade partners (IGM and EGM). Trade partners can use any of the communication modes like e-mail, web upload and FTP to transact their business with on ICEGATE. As we all know ICEGATE also involved in data exchange between customs and regulatory agencies. Customers can avail the services like e-payment, online registration, document tracking status, licenses status and import, export code status and so on..using ICEGATE. You can verify some more services in icegate website online. 1. One of the best infrastructure project which fulfills EC, EDI and data communication requirements. 2. It offers host of services like electronic bill filings, shipping bills and electronic messages between customs and trading partners. 3. Shipping & Airline Industries can file their manifests using ICEGATE. 4. Cargo logistic operators can interact with custom EDIs through ICEGATE. 5. Using ICEGATE you can exchange the data between customs and other regulatory agencies like RBI, Ministry of Steel...e.t.c. 6. Provides 24/7 help-desk and toll free number is 1-800-3010-1000.